Mornin' Dynamos! I'm trying something new today. I got a suggestion (quite a while back) that it would be nice if I posted links on how to do some of the techniques that I use (Here's a shout out, K!). I think that's a great idea, because I find cool tips and techniques all the time, but I haven't really had a good way to share them before. Jake suggested that I do 'Sunday School' twice a month, and it just all clicked into place. Do you have any cool tricks or helpful tips? Share them with us in the comments below! Maybe since it's September now and it's getting closer to fall, you could so some sort of autumn-themed thing. 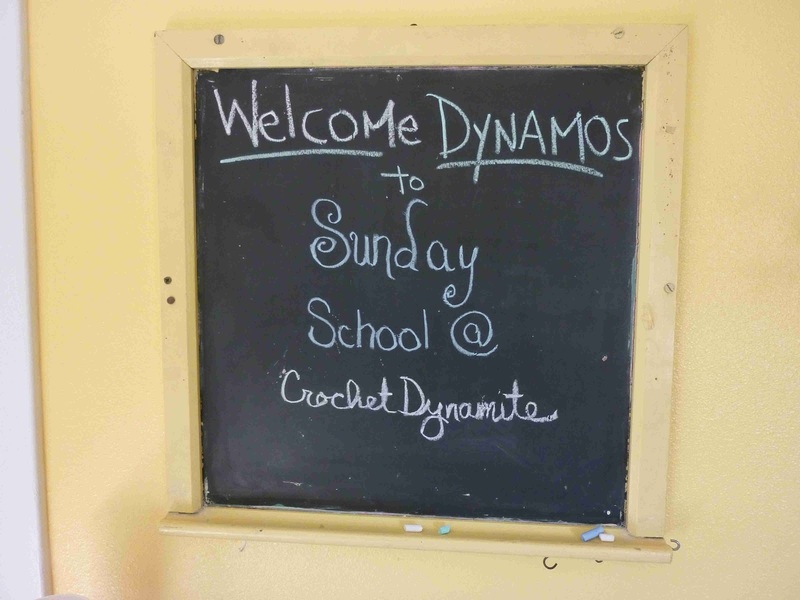 Crochet Sunday School rocks! Keep saving those links! June also has a great group of recent series on making color changes and front loop vs. back loop vs. both loops that were really great. Hi rengawk! Cool! I'll check that series out! Good idea to look for a charity to coordinate with. I will start looking into that... If not this first time, then for sure in the future. Crochet tips are so nice to learn8 Thank you for such a great idea! I think that is an excellent idea and thanks for the tips, I know some of those techniques but not all of them so I will definitely be checking them out. I think you should do some chemo caps CAL with different variations on the same caps, and perhaps some nifty awareness pink bracelets, with and without beads. In my minds eye I am seeing some wider bracelets with openings / pockets in them to hold things, like money or written notes, but they would be discrete pockets as to not be obvious that they were holding anything so they just look like normal bracelets / arm bands, also in awareness pink or other multiple colors. I totally am seeing those in my mind right now, it's way cool. The chemo caps could also have secret compartments in them with notes written inside, and on the notes are affirmations like "Never give up" or "I am with you" so when the wearer feels weak or just needs a positive reminder of hope that they are not alone, they can just reach inside the inner pocket of their cap or bracelet and read it! I was compelled to tell you what I see. Piper, that is an absolutely brilliant idea! My mind is racing with possibilities. I love (LOVE!!!!) it. I would have loved something like that when I was sick. Okay, that's what we're doing for October! Double yay!!! Great idea, Piper! Bless your overflowing heart for the links, especially the one for finishing amiguri-like bits. I use scrap yarn to make little balls for my friends with kitties, but I've never liked how I finished them. (The kitties didn't seem to mind. Or they were too polite to mention it.) Now I can rise up to feline perfection!